That's also why he takes cod liver oil daily (for omega-3's and the anti-inflammatory effect), vitamin K2 (can help fight off dementia and boost brain health), and probiotics (to build up his overall immune system), along with the supplements that he takes since we got him off his blood pressure meds. He takes it off the spoon and just holds it in his mouth until it melts and then swallows. Sounds easy, but I can't do it. It took him a while to get used to it and to not gag. He's a very disciplined guy and never misses a day. 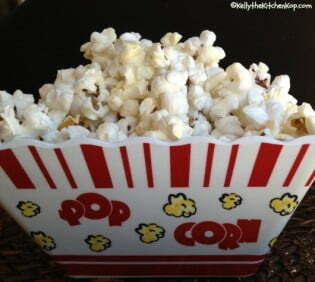 My tasty popcorn recipe with coconut oil (with butter too of course) or try this Kettle corn recipe. Wanna be naughty with a few healthy ingredients thrown in? Check out this Better than Garretts caramel corn recipe. You can also get the benefits of coconut oil through your skin when applied topically. It works well to help heal cuts or painfully dry skin, and is great on my hands after a day of changing diapers (back in the day) when I was washing them a lot. Again, if you just want to know where to get it, here's where we get our virgin coconut oil and here's where we get our refined no-smell/no-taste coconut oil. As always, remember I'm not a doctor or anywhere close, use your own judgment when deciding what to take or try when it comes to your health! Coconut oil is a healthy fat that can help to kick-start your metabolism, boost your energy, and even support your weight loss – it's very different from other fats because it turns into instant energy and isn't stored as fat. (Remember not all fats and calories are alike!) When it comes to healthy fats, coconut oil is a lot like butter, cod liver oil and olive oil because it has been used for thousands of years. Compare them to newer fats and oils like margarine, soy, canola, safflower, corn, sunflower and any of the others that you've only heard of in the past few decades, and think of how heart disease, diabetes and so many other health issues are on the increase; whereas people have consumed coconut oil in many parts of the world for centuries. You may not have heard what a healthy fat coconut oil is due to it's high saturated fat content, but coconut oil contains medium-chain fatty acids that are metabolized differently and can actually help protect your heart. It can also improve insulin levels and helping regulate blood glucose. Read Eat Fat, Lose Fat: The Healthy Alternative to Trans Fats, for more information on the benefits of coconut oil, especially as it relates to weight loss, along with some recipes to help you find ways to get more into your diet. A new look at Coconut Oil by Mary Enig with more on the benefits of coconut oil and lauric acid. Which coconut oil is best and what do the words mean? Organic means that the coconuts are grown without chemicals. From what I can pull together, “extra virgin” and “virgin” are the same – there are no industry standards to gauge this with. They both have to do with how many times the coconut meal (or coconut “meat”) was pressed to get the oil out. Sometimes it's called “extra virgin”, “virgin, or “first pressed”. Another source said that “extra virgin” means the least amount of pressure (and therefore less heat) was used, and that “virgin” means more heat, more friction, but higher yields. I think that because coconut oil comes from other countries that also muddies things up – we can have certain U.S. standards, or standardized terms, but it may mean different things depending on the country it comes from. “Raw”, “unrefined”, or “refined” all have to do with how much heat is used to process the coconut oil. All coconut oils use some heat, because otherwise certain components won't be removed that give an off taste. Read more here about refined coconut oil with no taste or smell. Here's where to get coconut oil with no taste or smell for recipes that a coconut flavor won't work well in. Read more here about Virgin, unrefined coconut oil. Here's where to get virgin, unrefined coconut oil. (Use the code KOP to get 10% off). Share in the comments what YOU love about coconut oil & how you take it? 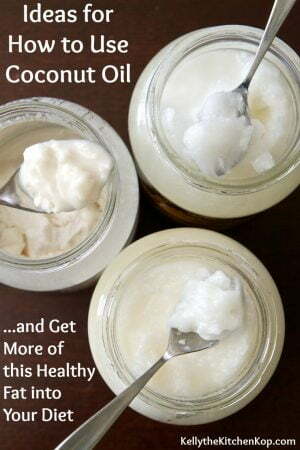 Wonder how to get more coconut oil into your diet and need ideas for new ways to use coconut oil? Which cod liver oil should you take? 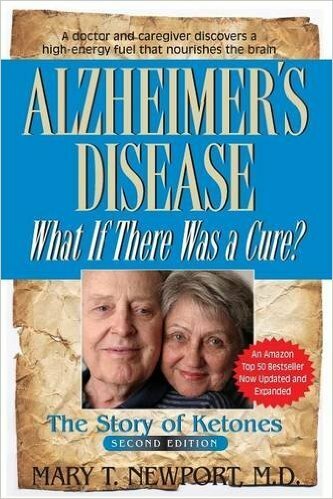 Mary, the doctor mentioned above, wrote this book about their story: What if there was a cure? I stir mine into warm water – can’t take it off the spoon. But my kids are allowed to spoon out of it anytime anyday! I might have missed it in the article, but about how much does he eat from a spoon on a given day? Kelly the Kitchen Kop That’s what I would have guessed, love the simple things that don’t require lots of fuss! Thank you! I’ve never heard of it fixing arrhythmia, that’s pretty cool! Mine goes away when I remember to take my magnesium. I have SVT (supra-ventricular tachycardia) and started taking a spoonful of coconut oil before running several months ago. It’s made a huge difference in the frequency of episodes (which happen most often during exercise for me). Heart arrhythmia is best addressed by looking at magnesium status. Ask the doctor for RBC magnesium blood test, or order it for yourself from an online ordering lab like Request-a-test.com. RBC magnesium should optimally be 6.0 to 7.0. Eighty percent of people in the U.S. are deficient in magnesium. Drink it in coffee, everyday! Anyone have info about coconut oil consumption after gall bladder removal? It’s so good for everything! 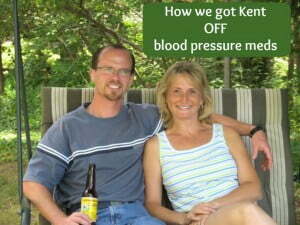 We do oil pulling for our teeth, and my hubby reversed a couple cavities! Have you heard of (ANH) Organic Virgin Coconut oil that takes a month to make? Hi Ed, ANH is another name for cold-pressed, right? I do agree coconut oil has many health promoting properties, but some caution should be heeded. If you trying to lose weight, even if your ultra low carb, coconut oil does not burn quite the same as fat in the body. Take it easy with coconut oil if you have any fat to lose. I just started dissolving 2 tbls coconut oil in warm water and drinking it each morning. It has only been three days but I don’t feel hungry around 9 am like I usually do. I HATE the taste of coconut so I might buy some of the capsules. Great post! Yes, I’ve heard that from a lot of people, that it can curb hunger. Some drink it in their coffee? Oil and butter do not mix at all with coffee. If you have no issues with dairy, full fat whipping cream really is the way to go, with no sweetener of course. It is vastly different at a molecular level than milk or half and half. Me? I much prefer to take my coconut oil in the form of chocolate fudge, faux Reeces cups, chocolate sauce or truffles or “no bake” cookies or other instruments of extreme torture ! It’s been a very gradual process! This post is such interesting timing! I have an arrhythmia called SVT (supraventricular tachycardia)–anywhere from twice a week to once every two months I have an episode of an extremely fast, inefficient heart rate. I’ve had it all my life and have gotten better and better at converting it back to a normal rhythm when it happens, but it can be really inconvenient, especially since I’ve taken up running over the past year. Well, I’ve been doing an experiment for about 6 weeks now, that consists of 3 parts. First, I take a spoonful of coconut oil before each of my runs. That was my husband’s idea because of how our heart uses fatty acids as its primary fuel source and the fatty acids in coconut oil are so quickly absorbed and efficiently utilized by the body. I was doing that for about 2 weeks before adding the other parts of my experiment and already noticed my heart felt much more “solid” during my runs. I next added a couple amino acids (taurine and arginine, based in part from recommendations in Dr. Jack Wolfson’s book, The Paleo Cardiologist. Taurine down-regulates the sympathetic nervous system and has an overall relaxing effect and arginine is a pre-cursor to nitric oxide, which is a vasodilator. I haven’t had a single episode since doing this and over the past 6 weeks I’ve run my longest trail runs so far (2-8 mile runs and 2-5 mile runs, plus my normal 2-3 mile routes)! Thank you. I got it to work. I had copied and pasted it initially and that was the problem. I had to manually type it in for it to work. 🙂 Good to know. Thanks for all the great info. The Perfect Supplements coupon code doesn’t seem to be working for me. It should be for anything on their site, correct? I’m trying to buy butter oil capsules. Any thoughts? Yep, should work for anything. KOP2017 with no spaces. I’ll try too and report back. Okay, yep it worked again for me just fine. Maybe try a different browser Leigh? For example if you’re using Firefox, try Safari or Chrome? 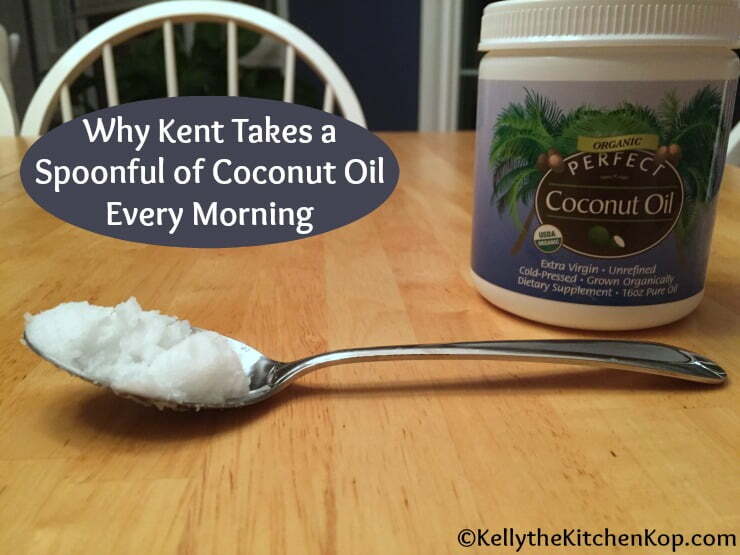 Has Kent noticed any benefits after taking 1 tablespoon of coconut oil? My father (who has passed away) had rapid deterioration from dementia. I found out about coconut oil’s benefits on slowing or stopping dementia/alzheimer’s, but I was not able to administer it for him because I lived far away. I told my sister about it who lived closed by but he complained about the taste. I take 1-2 tablespoons of coconut oil everyday in the morning with my lattee. I can’t stand swallowing it by itself. I use it mostly for ketogenic reasons. I just asked him and he said that since he started take coconut oil and the cod liver oil, his skin doesn’t dry out every winter like it used to. Other than that, he’s pretty healthy anyway, so didn’t notice anything else. Hopefully it’s working to protect his brain in ways we can’t see! Hi, Perfect Supplements also has coconut oil in capsule form if that would make it easier for you Leo!